Currently, few of the Indian ISPs, including BSNL, Reliance, Airtel, etc., have already started restricting their users from visiting specific websites. 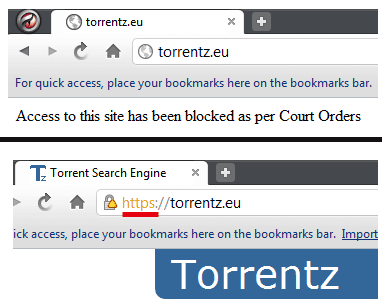 The display message cites a “Court order” as the reason for blocking such websites. The US Government has already blocked websites in the past on grounds of copyright infringement, and certain other countries have also started to follow suit. In the coming days, we might start seeing other service providers joining the same league. There is, however, a workaround to access these blocked websites legally without using a proxy. The trick lies in changing the protocol used for accessing the website. ISPs usually block the http version of a website, while the https version is still left open. You can access the secured version of blocked websites by using “https” instead of “http” in the address bar, when visiting these sites. If the “https” version of your preferred websites is also blocked by your ISP, there are still a few alternatives available for accessing them. Blocked websites can generally be accessed using proxy, Smart DNS or VPN services. But if you’re trying to access blocked media content (audio, video), proxy is usually not a good option, as they are slow and generally not suitable for streaming media. For unblocking media streaming websites, the best option would be to use a suitable Smart DNS service. However, Smart DNS services can only unblock a specific set of websites. The list of supported websites is usually available in the product website. If none of the Smart DNS services support your preferred website, you can try out a suitable VPN service as an alternative. Some Smart DNS and VPN services offer browser extensions (for Chrome and Firefox) to unblock websites within the specific web browser. The article below lists down some the popular browser extensions for unblocking websites. All of the above methods are suitable for unblocking different types of sites in different situations. You may want to try out all of these solutions before deciding the best option for you.